The Dividist Papers: I don't think President Obama is like a dog. He's more like a one trick unicorn. I don't think President Obama is like a dog. He's more like a one trick unicorn. President Obama was in Milwaukee on Labor Day and kicked off the fall political season by introducing his fire-breathing stem-winder stump speech for the fall campaign. As happens occasionally when a politician gets on a roll in front of a friendly crowd, the President took a short detour off message. Here he channels Jimi Hendrix to take a shot at his critics, saying "They talk about me like a dog." As soon as he said it I thought - He's going to regret that. "....as part of the largest new investment in America's infrastructure since President Eisenhower built the Interstate Highway System... jobs rebuilding our crumbling roads, bridges, and schools, repairing our faulty levees and dams, connecting nearly every American to broadband, and upgrading the buses and trains that commuters take every day... we will be investing $28 billion in our highways, money that every one of our 50 states can start using immediately to put people back to work.. the jobs that we're creating are good jobs that pay more than average; jobs grinding asphalt and paving roads, filling potholes, making street signs, repairing stop lights, replacing guard rails..." "We also have to build a new foundation for our future growth. Today, our aging system of highways and byways, air routes and rail lines is hindering that growth. Our highways are clogged with traffic, costing us $80 billion a year in lost productivity and wasted fuel... we're talking about is a vision for high-speed rail in America... I'm announcing my administration's efforts to transform travel in America with an historic investment in high-speed rail... The Department of Transportation expects to begin awarding funds to ready projects before the end of this summer, well ahead of schedule." - President Barack Obama - March 3, 2009 and April 16, 2009. 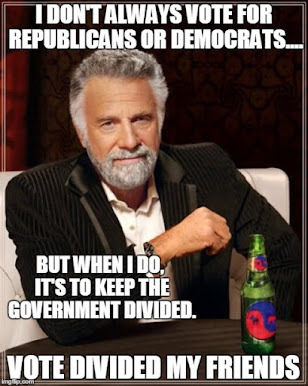 Indecision 2010 - Are You Ready for Some Midterms? No, President Obama is not a dog. 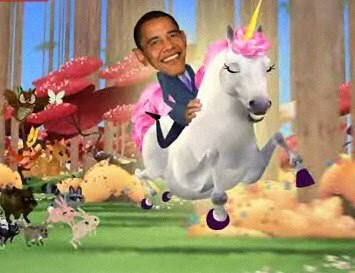 He is a one trick pony unicorn. For this administration there is exactly one answer to every problem. Spend more. Raise taxes to pay for new spending. Spend more. Borrow more to pay for new spending. Spend more. Every problem is a nail, spending is the hammer that the administration wields as every solution. So what if ARRA (the biggest spending program in US history until HCR a year later) did not stimulate the economy as expected? No problem - get a bigger hammer, because obviously, even more spending is the right answer this time. "It is incumbent on our Federal government to help cushion the blow for those Americans devastated by this economic contraction. That includes unemployment extensions such as are in the stimulus bill. If there are infrastructure projects that we know we really need, like upgrading the electric transmission backbone, and repairing dangerous bridges, there is certainly a case to be made to do the projects now and cushion the recession impact. Fine. I’m on board. The operative word being “need”. But to spend a trillion dollars, just for the sake of spending a trillion dollars,just because some economists and politicians have an unproven dogmatic ideological belief in Keynesian theory, or - more likely - using unproven Keynesian theory as an excuse to load up a porker the likes of which we have never seen before - strikes me as batshit insane." As Rachel Maddow points out, many Republicans complained that the 2009 ARRA porkulus legislation did not contain enough infrastructure spending. She is correct that the Republicans are playing politics now, just like the President and Democrats are playing politics now by pushing new programs before the election. Everyone understands that two months before the election, this is par for the course. But I have a solution that will get bi-partisan support if the administration is sincere about this program. Since (as clearly indicated by the President on Monday) the monstrous ARRA stimulus legislation did not have the right mix of infrastructure spending (if it did - why would we need a new program less than two years later?) 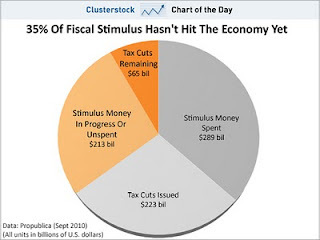 - then the solution is not to spend new money, but instead to fix the stimulus. If the Democrats believe they did the right thing ramming the ARRA stimulus package through - let it play out. But if it was wrong and we need this infrastructure, then reallocate the remaining unspent $200+ billion in the stimulus package to pay for the needed infrastructure. That is an approach that might elicit bipartisan cooperation - even during the election season. But the exact wrong answer for the the administration and the country, is to pile on new spending. More like a one trick Tick. He just keeps sucking our blood and leaving us with a viral infection. I just wanted to repeat that. it's not spending. it's racism! you didn't have a problem with Bush spending! Anon #2, Actually I did care a great deal about Bush spending, as evidenced by my posts here, here, and here. Problem being that Obama has been three times worse on spending and deficits in two years than Bush was in eight. Which by any measure makes him far far worse on spending then Bush. It is not even close. As bad as Bush was, Obama is worse. But hey... don't let the facts stop you from making your brain dead racism charge. BTW - I wrote a post just for Obama cultists like yourself. Check it out. 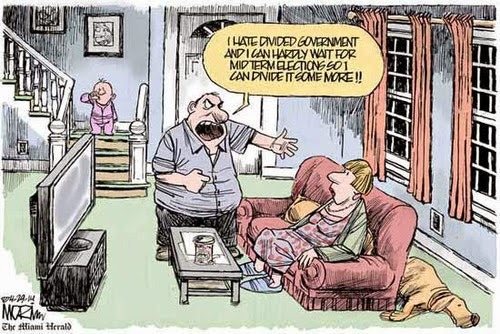 And when I say "It's the spending stupid." Please understand - I mean you.